Wonderful writing resting on top of infirm foundations. Almost a classic, Sunless Sea falls a few leagues short of its final destination. Sunless Sea's best moments are the ones I can't tell you about. Out on the 'unterzee' beyond Fallen London are islands to be discovered, and each of these islands promises a new story, a new idea, a new deftly-written spin on a sprawling dark fantasy with its roots in Lovecraft, Verne, Machen, Dunsany, Poe. The chance to explore a setting this inventive and diverse is rare, and you deserve the chance to do so without too much priming. I won't tell you why you should pay attention to the submerged rock formations near Polythreme, or why you'll breath a sigh of genuine relief when you first set eyes on Aestival. Instead, I'm going to discuss Sunless Sea's more mundane, less spoilable elements—and although I recommend the experience overall, a fair number of these present problems. That's the story of Sunless Sea as a whole: a seductive but intangible atmosphere that draws you in, punctured by jutting flaws that rise up from time to time to scatter that atmosphere to the wind. The game begins in December 1887. London has sunk into an underworld called the Neath, becoming Fallen London—the setting for Failbetter's browser-based adventure game of the same name. The city rests at the edge of a vast uncharted underground ocean. As the captain of a tramp steamer, you attempt to make your name and protect your crew in the face of dwindling supplies and mounting terror. Basic WASD-controlled naval exploration is matched with interactive fiction-style storytelling on land. The simplicity of Sunless Sea belies its hostility. Poor decisions and misfortune will rob you of your crew, you'll bankrupt yourself buying just enough fuel to crawl back to London's safe harbour, and you'll risk your captain's sanity venturing deeper and deeper into the unterzee. Failbetter know exactly how to walk the tonal knife-edge between fear of the unknown and the romance of a long journey. They do it with writing, first and foremost, but also with haunting audio and visual cues—the way your ship lights diffuse into a fog-bank, the distant sound of bells. Your captain can be lost forever, but Sunless Sea isn't a roguelike—its best features are authored narratives rather than anecdotes drawn from a dynamic system. Every time you die the islands are rearranged and you start a new journey. You can pick a different victory condition, if you wish, and the wealth of your former character's estate establishes the starting conditions of the new one. Overall, though, the experience is more like re-reading a choose-your-own adventure book than starting a fresh Spelunky run. As in Fallen London—and other games that use the StoryNexus platform—gathering and spending resources determines which stories you have access to and how you're able to progress through them. In addition to the supplies and fuel consumed by your ship, you also collect materials both physical and abstract. An example of the former might be a crate of souls, stored in your hold for delivery to a far-off deviless. An example of the latter might be a 'restful night', saved up to ward off nightmares. There's something of the boardgame to this aspect of Sunless Sea—a hard underlying structure that becomes more important the longer you play. It often works to the game's credit, adding strategic depth to your narrative decisions and inserting a degree of chance and individuality into otherwise scripted stories. The weakness of the StoryNexus system, however, is that it's ultimately about hoarding and gambling. This is the same compulsive loop that powers almost every browser-based management sim you could name. Sometimes, Sunless Sea's tremendous storytelling is enough to elevate the system out of those murky waters—as in the moment when you take a crew-endangering risk because the pragmatic alternative is so powerfully grim that you can't bring yourself to do it. At other times, the drive to maximise your odds of survival overwhelms the game's ability to spin a tale. As you visit and revisit islands you stop seeing the writing and start seeing the game. In one instance, taking tea with the locals might yield supplies while asking about the mysterious statue earns 'tales of terror'. I need supplies; I take tea. The story becomes a vending machine. This is a deliberately abstracted example, but it's a situation you will encounter in many forms. Repetition is integral to the game's structure, but repetition erodes atmosphere—an issue that Sunless Sea can only brush off with a mercurial flourish for so long. If the basic act of traversing the world produced more interesting situations, this issue might be less pronounced—but as it is, sea combat and travel have very little influence on the types of decisions you make on land. Combat is especially weak, even after the substantial overhaul it received during the game's time in early access. You line up your ship's firing angles and take pot shots at AI opponents that are incapable of generating an interesting challenge. Monsters are primarily interested in charging you, and success is a question of having enough firepower and armour to win the exchange. Pirates and other 'human' opponents fare worse, because the AI doesn't know how to shake a tail. Get behind most foes and they'll die by inches, turning in a circle forever in a futile attempt to bring their guns to bear. Even while attempting to roleplay the life of a non-violent explorer, I couldn't help but see pirate ships as floating loot chests waiting to be cracked open. 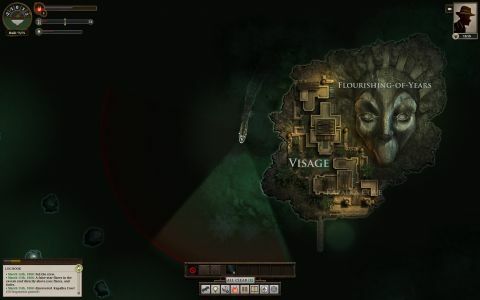 Sunless Sea doesn't need to be a great strategy game to tell a great story, but the two could have enhanced each other and it's a real shame that they don't. There are other, smaller issues. This is a game that is fundamentally about immersing yourself in a written narrative that confines its writing to a panel that occupies less than a sixth of the screen for no good reason. I experienced a few crashes, and frequently encountered instances of broken syntax and the odd case of incorrectly-assigned 2D art. These are by no means dealbreakers, but they add to a mounting list of caveats. I find myself wanting to return to the game even as I attempt to articulate its flaws. Sunless Sea is haunting, sad, exciting and energising by turns, and each new journey from the safe waters of Fallen London promises new sights and stories. It carries a recommendation because, ultimately, there's nothing else like it. I wish more games were this passionate about engaging the player's imagination. But it also represents a substantial missed opportunity, one that has become harder to ignore with every hour invested: its supporting structures are merely passable when they could have formed the basis of a classic. You will return from your travels with tales to tell, but you may have to gloss the odd nagging detail. Disclaimer: parts of Sunless Sea were written by Richard Cobbett, a regular freelance contributor to PC Gamer. I used to see Richard from time to time when he lived in Bath, but haven't spoken to him very much since he moved away—and not since he began work on this game. I am confident that my judgement of the game has not been influenced by our acquaintance.